As I've intimated here multiple times, the South Riding Tri is my marquee race. I've run it every year since 2011 and since it's the exact same course, it's made it extremely easy to see my progress. This year my goal was to continue that trend, and my stretch goal was to drop my time from 1:04:21 to sub-60. 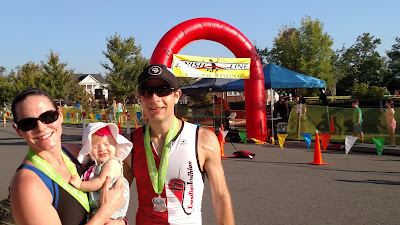 This was my first triathlon since my daughter was born, and more importantly, my wife's first triathlon since giving birth. My mom spent the night with us on the eve of the race for Ellie duty. Unfortunately, since my wife is still nursing, there's not too much my mother could do. I swear that Ellie has some sort sense whereby she can tell that there is an important even that we would like to be well rested for the next day and will then have a terrible night sleep. Ellie required constant attention that night and had my wife up for the day a hair after four. On top of that, she did everything in her power to make sure that I got a good night's sleep. It's hard for me to express how much that meant to me. I got to sleep in until about 5:20. I woke up, immediately ate an English muffin with peanut butter, honey, and banana on it, then I finished getting dressed, put the bikes on the car and ran through the check list one last time before leaving my daughter with my mom and heading to the transition area with my wife. The race is well organized, especially for a community event. The transition area is clearly marked and there are plenty of volunteers to give direction and instruction to the many first-time triathletes. Neither of us had any issues setting up our bikes in the transition areas. We got our body markings and chips without issue and hopped in the pool to warm up. I'm always terrified that I will wear myself out with too strenuous a warm up, so I only did 100 to make sure I could still jump into the water (feet first, mind you) and that I hadn't forgotten how to swim. My wife went with a more logical 400, and that's probably why she beat me by 2+ minutes on the swim (not because she had a better warm up, but because knowing the proper amount of warming up to do is a byproduct of being an amazing swimmer, which she is). The trickiest part is the snake swim, which requires that everybody submit an accurate swim time for proper seeding. They do their best to make sure that people go to time trials, but there's always that one person who puts in an arbitrary time ("Oh, Ledecky can do 400M in under 4 minutes? Well I can probably do it in 6, then.") and makes things difficult for the people directly behind them. I'm happy to say that this year that was not the case, at least for me personally. I was seeded 44th with a swim time of 7:10, which I swam in the middle of a practice a week or two ago. The person behind me may have been "that guy" because I ended up swimming a 7:34 (I'm blaming it on the tri suit) but had no pressure from the person behind me. And with 15 seconds spaced between each seed, I should have been overtaken. However, when I looked over, I could clearly see three people stacked up on each other, so clearly two people had caught up with the person directly behind me, and he or she was keeping them off of my feet. My wife was seeded 22nd, so she would have been getting out of the water very shortly after I got in, so unfortunately, I didn't get to watch her get out. But to be honest, I get in "the zone" as I'm waiting in line to get in the water and get tunnel vision, so I probably would not have noticed her getting out if I was within the next 10 people to get into the water, anyway. My swim time is probably the thing I was most disappointed with in the race, which is ironic because it really had such a small impact in my overall time (34 seconds). I hadn't practice my T1 at all this year, so I was a little nervous about it, especially since this would only be the third race where I would have my pedals clipped in on the bike and not put my feet in the pedals until I was out of transition. That ended up a non-issue as my T1 time was a few seconds more than a minute. It put me in a great spot to be sub-2 minutes for my combined transition times. The portion of the race that had the most uncertainty for me was the bike. I've been riding pretty regularly on my bike trainer, but I haven't been doing any sort of training plans. I was pretty sure that I'd do better than last year, but I wasn't sure how much better. My goal was under 33 minutes, but that was to meet my stretch goal. I've ridden the course several dozen times (one of the benefits of a community triathlon that's in your community), but only once this year. That was also a couple of weeks ago, and according to Strava, I set a PR on the SR Tri - Bike Course segment, so I felt good about that. The bike went without incident. This was the lowest I've ever been seeded, so there weren't too many people for me to pass, and I got passed by a few myself. One of the people I did pass, but did not expect to, was bib #22 - my wife. It was with about two miles left to go in the bike. I thought that we'd get to T2 around the same time, but it turns out that we got to see each other a bit sooner than that and give each other some encouragement. With about a quarter of a mile to go on the bike, I removed my feet from my shoes and shifted into a low gear so I could shake out my legs with some high cadence pedaling. It also made the dismount go very quickly. I finished the bike about 50 seconds slower than I would have liked at 33:50. T2 was a breeze. I put my bike away, threw on some socks and my shoes (which have bungee laces in them for exactly this reason), grabbed my hat and sunglasses, and put them on as I made my way to the transition area exit. My T2 was ~42 seconds, which means that the transition is the only portion of the entire race where I actually hit my goal. My legs were jelly for the first mile and a half of the run, which for a 2.9 mile run (ahem, "5K") is not very good. I had trouble catching my breath coming off of the bike and it wasn't until that point that I was finally able to calm down and get in a nice rhythm. Interestingly, my first mile was not nearly as slow as it felt - 6:51. My second mile was my slowest at 7:02, and I had a negative split for the last mile at a 6:36/mile pace (since it was actually .9 miles). I do remember thinking to myself that I needed to pick it up for the trip to the finish line, and I did that. My total run time was 20:14 - also nowhere near my goal time of sub 18-minutes. 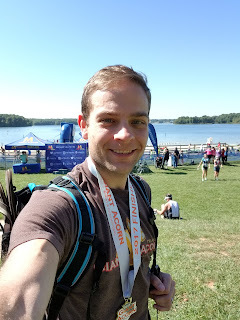 My overall (unofficial) time was 1:03:35, putting me 10 of 126 overall, and 3 of 8 in my age group (though the guy that got first in my age group was second overall, so I was awarded second place in my AG). I'm proud of my improvement over last year and especially continuing my trend of improving every year. This year, training wasn't so much training as it was exercising. So I'm looking forward to putting in place some specific training plans with a specific goal over the next year. 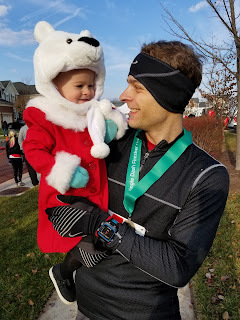 It should also be that much easier to train with a daughter that becomes more and more independent (and provides that much more weight resistance in the stroller!). And of course, a baby that sleeps will make everything that much easier. My wife also did really well at 1:16:48. She was 12 of 104 overall and 5 of 12 in her age group, and while she didn't do as well as she did last year, I'm still super impressed that she did as well as she did, just 7 months after giving birth. If you're reading this, hun, you are the real hero here! Falling on the sleep grenade to let me do as well as I can and still performing as well as you did is just incredible. You are awesome!